Aufbau is a powerful responsive building & construction WordPress theme. Itâ€™s suitable for many corporate website such as Building Service, Construction Company, Architecture, Builder, Cleaning Service, Contractor, Electrician, Engineer, Handyman, Painter, Decorating, Flooring, Partitions & Ceilings, Plastering & Rendering, Carpentry & Joinery Refurbishment, Plumper, Renovation & Decoration Service, and general corporate website. 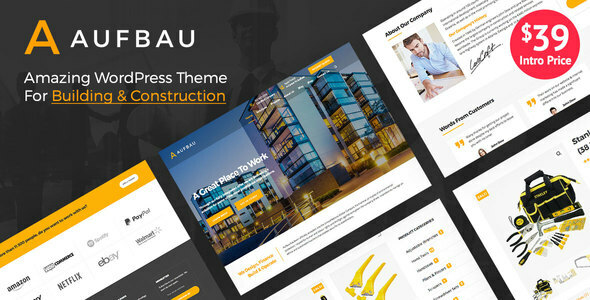 Aufbau â€“ construction WordPress Theme comes with Unyson framework. We have been developed our theme, collected every feedbacks from previous customers and put everything into this theme. It also comes with WPBakery (Visual Composer) the best drag & drop page builder on the market. The theme is super flexible with tons of great features. Aufbau is also featured with Revolution Slider & Essential Grid, the most powerful slider and grid plugins on the market. Save $85 Plugins Value â€“ included with Revolution Slider $25, Essential Grid $26 and WPBakery (Visual composer) $34! 10+ Header Layouts â€“ With ability to control logo, navigation spaces. Custom CSS â€“ Put your custom css easily via theme option. Easy to use WPBakery (Visual Composer) â€“ the best drag & drop page builder on the market. Import & Export â€“ Ability to import and export theme options, widget and pages easily. Post Format â€“ 4 post formats â€“ Standard, Image, Video, Link. Sidebar Manager â€“ Create sidebar and assign to individual pages/posts easily. NB! â€“ Images license in preview demo is not included in theme package!